This is the easiest casserole you will ever make. I heard about this a few years ago on Good Morning America, this is a version of Charlie Gibson's Casserole. I changed a few things around to my family's likes and now you have Doritos Casserole. I am serving it tonight with corn on the cob that I froze this past summer. We eat a salad with this casserole too. Just depends on what sounds good that day. So corn on the cob it is. Crush Doritos in the bag they came in. Much easier if you ask me. Add to crushed Doritos, chili, enchilada gravy and half of your cheese. Pour into a 9x13 pan and spread sour cream over entire casserole evenly and top with remaining cheese. Place in a 350' for 30 minutes or until bubbly and hot. We really like this. Hope you will give it a try because this is "what's cookin" tonight. Just the name freaks me out! It looks like a tamale pie, which I am going to attempt (though I am not a casserole girl) for super bowl! 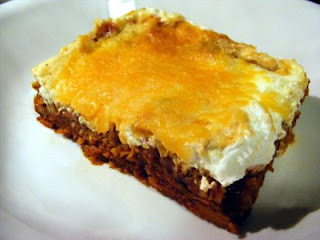 Yes, it is a lot like a tamale pie but easier.